A Patriot Launching Station Enhanced Operator is an important part of the Army's air defense artillery team. They're part of the Patriot missile system team that maintains and launches this technologically advanced system, which consists of an engagement control station, electronic power plant, communication relay group and up to eight launching stations. The Patriot Launching Station Operator works directly with the Patriot launching stations. This job is a military occupational specialty (MOS) 14T. These soldiers conduct preventive maintenance checks and service vehicles and operate a 10-ton crane. They'll perform checks and adjustments and load the M60 machine gun, as well as maintenance checks on the Radar Set, the Engagement Control Station, the Guided Missile Transporter, the Launching Station and the Guided Missile Canister (all parts of the Patriot system). 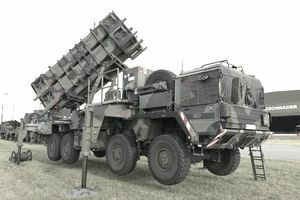 In combat situations, this MOS will load and reload Patriot missiles, which may include engaging with hostile targets. Patriot Launching Station Enhanced Operators will assist with tactical overlays, including mapping, reconnaissance, and selecting positions. They'll also supervise lower grade soldiers and give them technical guidance. And these soldiers also prepare situation reports and warning orders. Some of the skills you’ll learn in this job include, as the title suggests, learning how to operate Patriot technology and rocket systems, as well as artillery tactics and battle strategy. Job training for MOS 14T requires ten weeks of Basic Combat Training and 13 weeks of Advanced Individual Training with on-the-job instruction. Part of this time is spent in the classroom and in the field under simulated combat conditions. Successful candidates for this job need to score a 92 in the Operators and Food aptitude area on the Armed Services Vocational Aptitude Battery (ASVAB) test. The subtests in the OF area include Auto and Shop Information, Mechanical Comprehension,.Word Knowledge and Paragraph Comprehension. Since you'll be handling advanced, highly technical weapons systems, in order to qualify for MOS 14T, you'll need a confidential security clearance. This may involve a background check into any criminal activity or drug use, as well as mental and emotional fitness. Normal color vision is required (no colorblindness), and soldiers in this job must be U.S. citizens. What Is a Multiple Launch Rocket System Crewmember? What Is an Unmanned Aerial Systems Operator (15W) in the Army?